Where do they put Pet Buddies? 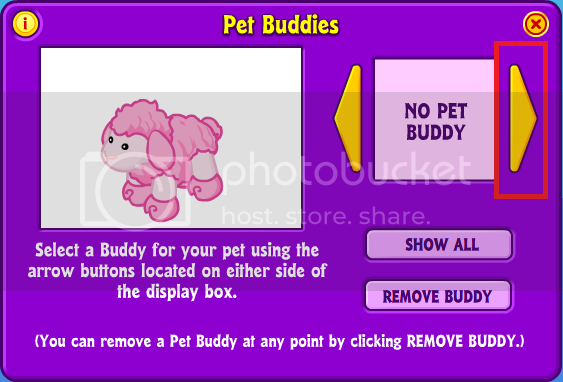 Answered: Where do they put Pet Buddies? I purchased a pet buddie good fairy from the E store and I can not find her? It is not a code, she should be somewhere in webkinz world. Does any one know where they are? I'm assuming you had her transferred to webkinz world? If you had her transferred there should have been a pop-up informing you of your eStore purchase. Since the Fairy Friend is a zum buddy, I am assuming she is located in the same place as zumbuddies. I do not own one myself, but this would be my guess. To locate a zum and equip it to your pet you first go to your room. In the top right corner of the room you have your task bar. The two options on it read Dress and Ask Pet. The far left option has a little face on it. So you click on the little face and you get a window that pops up that looks like the image below. As you can see, my pet has no zumbuddy attached at the moment. So I need to click the arrow pointing right to find a zumbuddy. After clicking the arrow, I found my zumbuddy. It should show up in the window with your pet. You can only equip your zumbuddy to one pet at a time. So if it is already attached to a pet, you can't attach it to a second one unless you unattach it from the first. Then click on the "X" in the purple box we're working in. And your zumbuddy is now attached and floating above your pet! Have fun with your new fairy friend! Let us know if you still have trouble locating her. Re: Where do they put Pet Buddies? are you able to go to a zum house? i had a cat kinz clip are kinz clips don't show up with the zumbuddies.